The Regional Respiratory Centre in Belfast Health and Social Care Trust identified the need for an easily accessible regional specific information tool on oxygen therapy. This has resulted in the development of a new oxygen therapy information package called O24U designed for the busy healthcare professional. HSC Innovations worked closely with Marion Doherty (Staff Nurse) and Dr Jacqui Gamble (Sister) in the Regional Respiratory Centre, based in Belfast City Hospital, in marketing the O24U package. As a result of this we have now secured the financial support of BOC Healthcare to assist in the dissemination of the O24U therapy information tool. O24U is now available through the trust intranet e-learning site and available by request on CD to those users outside the Trust. Belfast Trust users may visit this link. 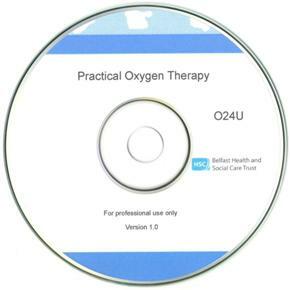 If you would like to request the O24U therapy information tool on CD, then please contact Marion Doherty in the Regional Respiratory Centre, Belfast City Hospital – tel: 028 9032 9241 Ext: 2078 or e-mail: marion.doherty@belfasttrust.hscni.net.